GstarCAD 2019 Collaborative Design is the worlds first DWG-based collaborative design system. It enables cross-department and cross-team collaboration, allowing designers/draftsmen to work together more efficiently on projects and significantly reducing the design errors and cost. The collaborative design system is especially applicable for manufacturing or construction companies where people need to frequently use Xref to work with each other and the overall team efficiency is highly valued. 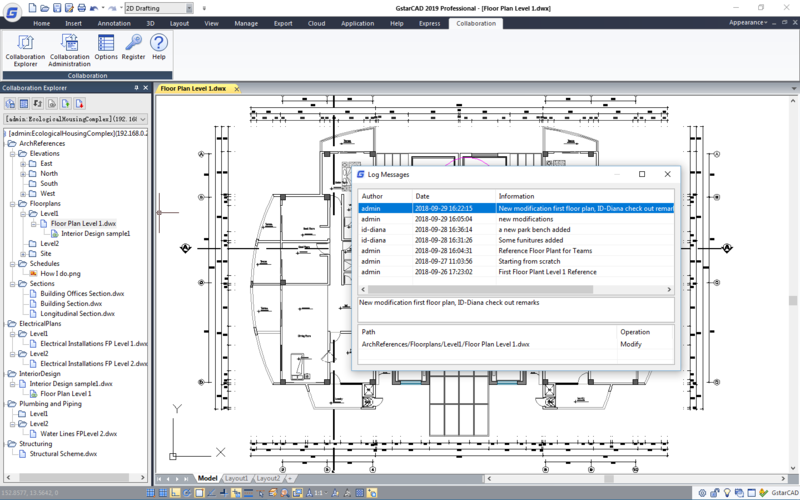 Meanwhile, based on the new technologies like data incremental storage and transmission, Collaborative Design of GstarCAD 2019 is also implemented as a drawing version management system, making it very easy to trace and return to any previous version and locate design changes by one click, and ensuring design quality and overall accuracy of specific projects.